India's first prime minister, Pandit Jawaharlal Nehru, was born on November 14. After his death in 1963, his birthday has been celebrated as children's Day in India.Children's Day is not just a day to let the future generation have its say. It is a day to remember a leader who, in his quiet but determined way, laid the foundation to convert a nascent nation into a world power. with them, the expression of intense concentration as he listens to them reveals his commitment and attitude to children. 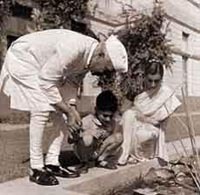 Children to Nehru were little adults in the making.Nehru, to children, is never the Indian political leader and prime minister. He is always Chacha Nehru - Nehru Uncle.